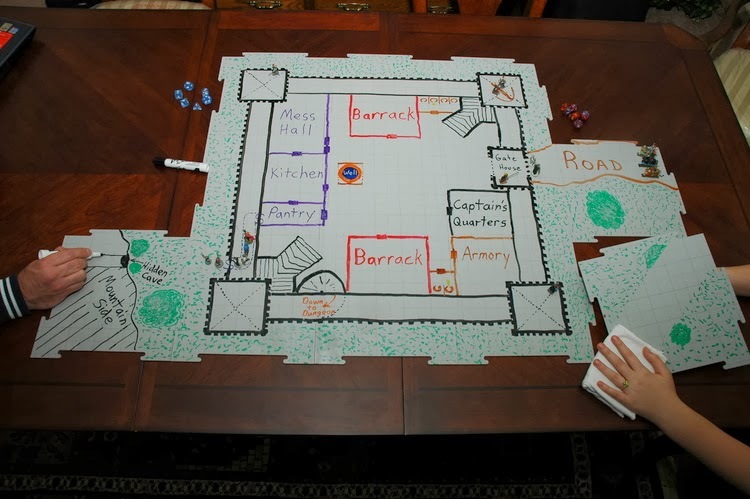 Of the various sorts of battlemats employed in recent editions of Dungeons & Dragons and similar miniatures-based games, Tact-Tiles may have been the most popular and well respected. Indeed, my 3e D&D game’s dungeon master swore by them! Manufactured by BC Products, these modular, hard plastic, dry-erase tiles are loved by players and referees alike. They’re resilient, portable, easy to reconfigure during play, and clean off nicely after the game. However, their high quality came with a high price tag—more than $40 for a set—and the price has risen considerably on the secondhand market ever since the product was discontinued in 2007. Now, role-playing game publisher Void Star Studios—developers of Strands of Fate, Strands of Power, and Nova Praxis—have announced their purchase of the rights to Tact-Tiles and their intention to launch a Kickstarter to fund a new production run. Click here to read the full post at Fanboys Anonymous. As a longtime fan of Magic: The Gathering—I’ve been playing on and off since 1994—I’m excited to post about the game here on Fanboys Anonymous. I’m largely a kitchen-table player who occasionally plays Draft or Sealed, so my posts will be aimed more toward the casual audience than die-hard Constructed players. That said, let’s dig right into the new set! Wizards of the Coast has published a full spoiler and release notes for Born of the Gods, the second set in the Theros block. It retains the previous set’s flavor focus on Greek mythology and mechanical focus on enchantments. In addition to three returning mechanics from Theros, it has two new mechanics: Inspired and Tribute. Might Arrow and The Flash Spin Off a Live-Action Teen Titans TV Series? The Teen Titans lineup best known to the public is that of the Murakami cartoon: Beast Boy, Cyborg, Raven, Robin, and Starfire. Those characters first appeared in The New Teen Titans, the team’s 1980 Wolfman/Pérez relaunch. The original team’s roster included Robin, Kid Flash, Wonder Girl, and Green Arrow’s sidekick Speedy. Is it coincidence that the upcoming slate of live-action DC programs includes all of those sidekicks’ mentors? (Except for Robin, but as the only DC sidekick with name recognition outside the comics world, he needs little introduction for the casual viewer.) Is DC planning to produce a Titans series as a nexus for their TV universe, much like Marvel’s movie Avengers franchise? With a new year comes a new blog. Here you’ll find posts about my writing, about gaming and game design, and other genre-related matters. Feel free to comment on anything you find interesting; this blog won’t bite!